TalkingTGauge.net • View topic - New products for the Talking T Gauge shop??? New products for the Talking T Gauge shop??? In about a month's time I'll have some time available to start thinking about extending the range of 3D printed products in the shop....so I thought I'd start a thread to give everyone the opportunity to put forward ideas for new items. What sort of printed items would you like me to take a look at producing? All suggestions and ideas will be considered...so over to you all! Re: New products for the Talking T Gauge shop??? Bungalows, Mobile homes(quite a lot of mobile home sites are near railways be they holiday homes or residential), Arcade (3-4) of modern 70's style shops, smaller more modern station building. Rolling stock wise waiting in anticipation of your wagons, maybe bogie tank wagons( would work well as are freight traffic for the bridge) and possibly a car coach for the old London Olympia/Stirling overnight motorail sleeper trains. Would a class76 work stretched a little bit to fit a 16m chassis then I can use some of those overheads that I took off my 103 sets Totally different option for people - try to model parts of the Woodhead route. Just my 2p worth for now. 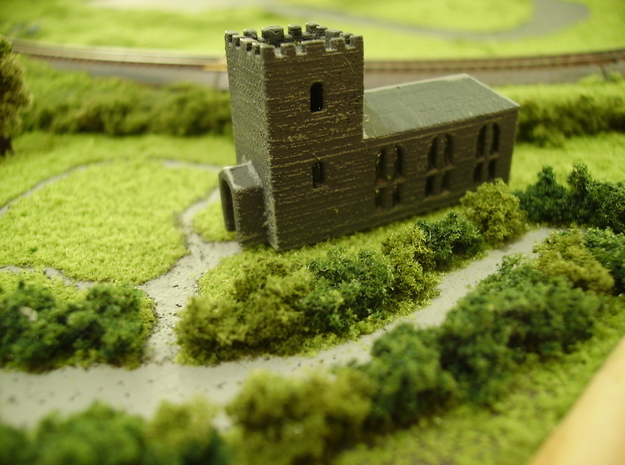 The church on Robins Run is a paper model. I bought a bag of part complete N gauge paper/cardboard building kits for a measly sum (50p, I think) at a show a few years ago and scanned and printed a 1/3 copy of the cards for this church, and made it up from that. I think a church similar to that one is going to make the "to do" list. I've got a few bungalows from The Bridge that I could tweak.....another one for the list. I do have some mineral wagons printed for testing.....I think the problem may be weight - they might be too light!! But another one for the list. On the loco shell front, I could easily take a look at one or two different loco classes. A 76 could be the first candidate. I do wish the three axle bogies were available, though!! Mike..would you be able to dig out some photos of the 70s style shops and station building you have in mind. Will sort out pictures later. I think possibly both could be single storey and variations on your Bank building. I know picture of N gauge model but something similar in a row of 3 might work. Sort of mini arcade found on council estates. Station Building I cant paste link to picture but something along the lines of Sevenoaks Station or something similar, I believe I managed to post a picture of something more modern in my thread viewtopic.php?f=10&t=373. Have to admit when I was thinking about bits I did not include shape ways because it is a pain from the mobile phone.